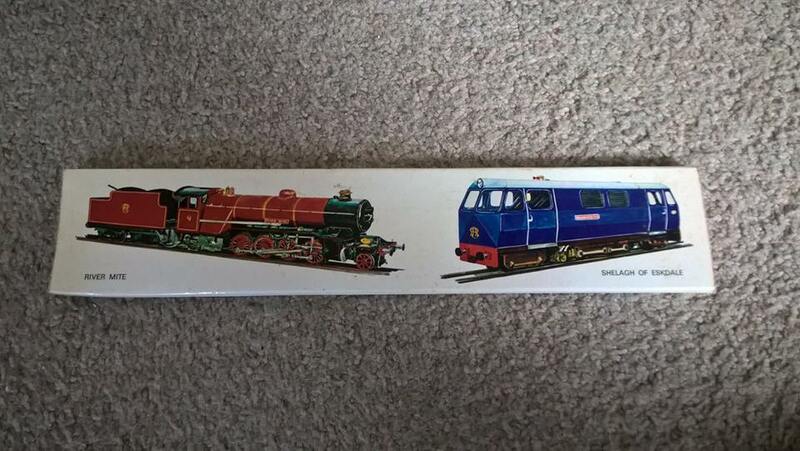 Auction of Ratty Memorabilia in aid of the Train from Spain appeal being held after the R&ERPS AGM on the night of Saturday 9th July at Dalegarth station. For those unable to attend, postal bids will be accepted – details in Album comments. More lots to be added before event. Postal bids For those unable to attend the AGM social evening, postal bids are invited for all lots. Postal bids should state your maximum bid, the lot number and description of item for which the bid applies, your name, address and contact telephone number. Bids should be posted to TfS Auction, 17 Woodlands, Great Corby, Carlisle, CA4 8LX to arrive no later than Wednesday 6th July 2016. Bids will be included on the night during the relevant lot number and will win if no higher bid is received in the room. Winners will contacted on Sunday 10th July 2016 and must arrange collection of items from Ravenglass on a mutually convenient date when payment must also be made. AUCTION LOTS Click to enlarge images. Name the Train From Spain! http://trainfromspain.org/name-and-livery/ Follow this link to the page on our website where you can suggest a name for the Train From Spain! 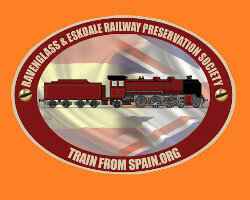 We are actively encouraging the public to send ideas for a name and a livery for the Train From Spain for when it is running on the Ravenglass & Eskdale Railway. So get your imagination running wild and make your contribution today! Your idea for a new name or colour scheme could be the one given to No.8457 in time for its commissioning on the railway… Terms and conditions are set out on the downloadable forms. Go on, take a look, and support the Train From Spain! Volunteering for the Train From Spain. Train From Spain Trialled at Ravenglass! Train From Spain Arrives in Lakeland! The Train From Spain has landed at Old Hall Farm, Bouth, South Cumbria, after an epic thousand-mile journey from Spain. The delivery took place today, 1st February 2016, at around midday, and was attended by members of the Train From Spain Appeal team. The Train From Spain Appeal was also featured on BBC Radio Cumbria this evening, and you will find audio clips at the following intervals upon clicking the link: 00m00s – 00m20s 02m35s – 03m10s 21m30s – 25m45s http://www.bbc.co.uk/programmes/p03g3y6l Don’t forget our Open Day, Saturday 6th February at Old Hall Farm, where you are welcome to come and see the engine for yourself (10am-2pm). Train From Spain Exclusive Viewing Day on 6th Feb (10am-2pm)! Our haulier, Dornack International Ltd, was joined by Train From Spain project members Karl Bartlett, Stuart Harrison and Peter van Zeller on Thursday for the loading of the locomotive, in readiness for the move to its new home in the Lake District! Here are some of the photos from the loading…! Follow the link to hear TrainFromSpain’s Peter Mills on the Mike Zeller Breakfast Show this morning. Move to 1h 19m 35s for the start of Peter’s interview all about the loco and the project. http://www.bbc.co.uk/programmes/p03dplhw Did you know? You can also follow us on Facebook. Search for ‘Train From Spain Appeal’ to find us! Our very own Peter Mills is being interviewed on the breakfast show on BBC Radio Cumbria about the Train from Spain appeal. The interview is expected to be broadcast tomorrow morning, Friday 22 January, at 7.20am. Meanwhile, the appeal team is busy following up other leads for publicity.